Jack Johnson, Jack Close and Brad Swain, who have signed scholarship forms with Halifax Town. 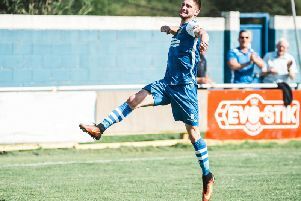 Three local lads who played alongside and against each other at junior football level have met up again having signed scholarship contracts with Vanarama National League side Halifax Town. Centre-half Brad Swain and striker Jack Close have been close friends from a young age when both played for Castleford Town juniors. Both were taken on by Doncaster Rovers’ Academy, but after being released have now found their way to Halifax where they have met up with full-back Jack Johnson, who they played against as youngsters when he was part of the Kippax Juniors team. All three are now part of Halifax’s youth set-up hoping to go on to make the first team while continuing their studies as well. Proud dad Tony Swain, who runs the Dishy Fish shop in Knottingley, said that it was an amazing coincidence that led to the three local youngsters all being set on at the same time by the National League outfit, but it will help them in their bid to become professional footballers. He said: “Jack Close started at Cas Town when he was five, same as Brad. “They used to win everything when they were little. They had some very good footballers and a lot of the players from that team went on to get signed. “Jack Johnson actually played against Brad and Jack when he used to play for Kippax. “I remember Jack was a very good player and the coach used to put Brad on Jack to stop him from playing. “When they were little they had a bit of a rivalry whereas now they are training together as a team. “They were all at Doncaster at one time. Brad and Jack Close actually played together for Castleford Town from the age of five up to 10 then believe it or not they both got signed on by Doncaster. “Jack Johnson got released when he was 14, but he is now at Halifax as well. They’ve all met up again. It’s nice that local lads have gone through football together and have ended up in a football environment. They’ve all got scholarships with Halifax for two years. “What they do is put them through education for two years and it’s full-time really, it’s education plus football and training. It’s not easy at all. He said: “He’s had trials with some clubs like Leeds United and Bradford City and when he was 10 he signed with Doncaster. He expected to get a scholarship at Doncaster, but it’s all about opinions is football and sometimes people get it wrong. Tony explained how the move to Halifax came about. He added: “From Doncaster Brad kept on training because he wanted to keep going and he trained at Mansfield then went on trial at Barnsley. “He played in three trial matches and I thought he did really well, but when they pulled us into the office they said they had already given out eight scholarships and they only had nine. The other one they were going to give to a striker. “Vinny Brockie, coach at Barnsley, said to Brad ‘don’t give up, I can open doors for you’. That was on the Thursday and on the Friday morning I got a call from Steve Nichol, at Halifax, asking if I could fetch Brad in to play in a game. “He played, did well and they signed him.